Online registrations for team tryouts close at 9pm on Friday, Sept. 11th!! 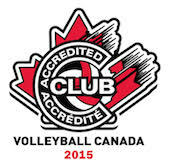 The online tryout sign-up for the 2015/2016 season of Competitive and HP teams is now CLOSED. You can still register at the door. Please bring the following forms with you along with a $40 payment (exact cash or cheque payable to Maverick Volleyball Club accepted only). See our tryout page for all the information you need to know for our 2015 tryouts.